What follows is not necessarily endorsed by the countries, sources or organisations concerned. 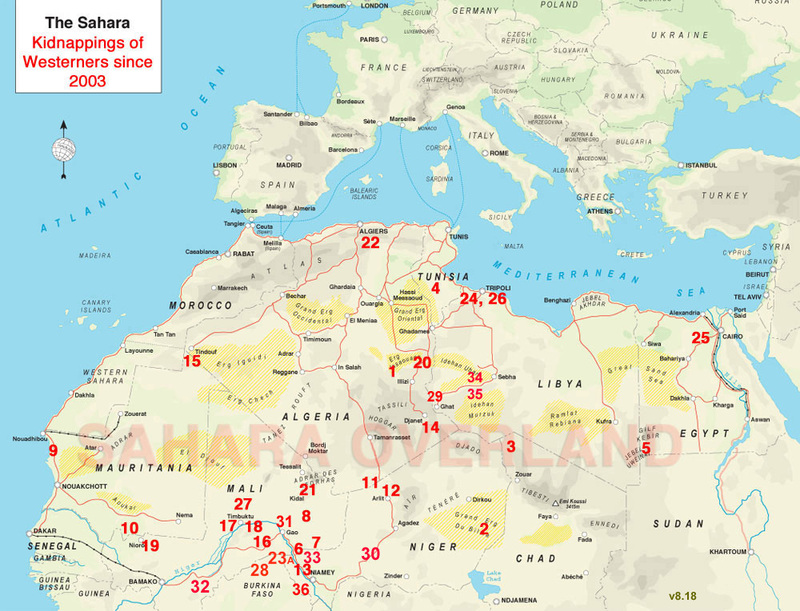 The map above and list below identify the dates, locations and outcomes (where known) of reported kidnappings of over 150 Westerners for lucrative ransoms, dating from the first such event in Algeria in March 2003 (#36). Back then European desert tourists were the target which led to the gradual collapse of Sahara tourism, both independent and organised. As a result such incidents slowed right down in the Sahara. The regional disruption following the 2011 collapse of Libya drove a further nail into that coffin, and with no desert tourists left to kidnap in Mali, Niger or Libya (or restrictions combined with greater security measures in Algeria and Mauritania), further south in the Sahel ex-pat mineral, as well as NGO workers and missionaries have now become new targets. This new thread follows such events in the Sahel and West Africa where the complexity of the many conflicts along with the seeming collapse of state control in the countryside of Burkina Faso has made things worse. In all cases bar 2, 3, 5 and 36, the victims of desert abductions were grabbed by (or passed on to) Islamist militias, including Al Qaeda of the Islamic Maghreb (AQIM) or ISIS-affiliated groups to eventually be released for ransom following lengthy captivity in northern Mali. In 2018 there are now so many splinter groups it’s hard to keep track and lately ethnic Peul (aka: Fulani) got in on the act, reviving ancient ‘farmer vs herder’ grievances over land and water as old as Cain and Abel. So the regional instability initially kicked off by jihadist groups in northern Mali following the fall of Gaddafi has spread southwards, seeing a steep rise to inter-ethnic violence by Sahelian militias. Any payment of ransoms was usually denied by the overseas governments concerned, although arrangements are usually made via third parties to actually deliver the cash. During the Gaddafi era, the Libyan state was one such conduit, and local intermediaries got rich negotiating ransoms. Wikileaks identified Baba Ould Cheick, the Mayor of Tarkint as beneficiaries. The former Burkinabe president Blaise Compaoré was another. Interesting FCO document from 2013. 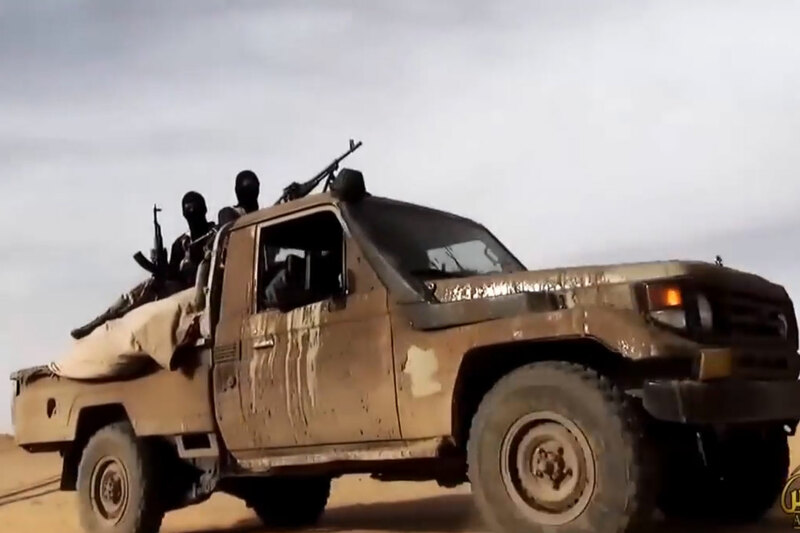 ‘AQIM’ or even ‘AQ’ has now become a shorthand for the various jihadist groups (including MUJAO) who until early 2013 roamed free in northern Mali with little obstruction (and in cases, quite the opposite) from the Malian government. Some have since have regrouped in southern Libya, but such convenient abbreviations rather play into their hands. Many of these groups compete with each other for influence and a share of the gains from people- and drug smuggling, as well as regional extortion and kidnapping. Some have now separated from AQIM and re-affiliated themselves with the even more brutal IS (see below). Excluding In Amenas (#20; more below), al Ghazi (#23) and Sabratha (#26), in the Sahara 13 hostages have died or were killed in captivity over the years. 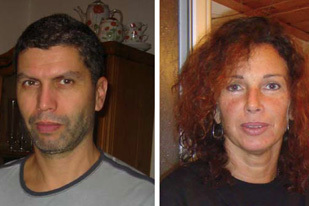 In other incidents, a French family was killed in Mauritania (Aleg, 2007, left), an American shot in Nouakchott (June 2009), another in Egypt, in 2014. and another in Burkina in January 2019. Over a dozen Western tourists died in the 2011 Marrakech bombing, and in 2015 many more were killed in separate events in Tunisia as well as hotel attacks in Mali and Ouagadougou (2016 and June 2017). 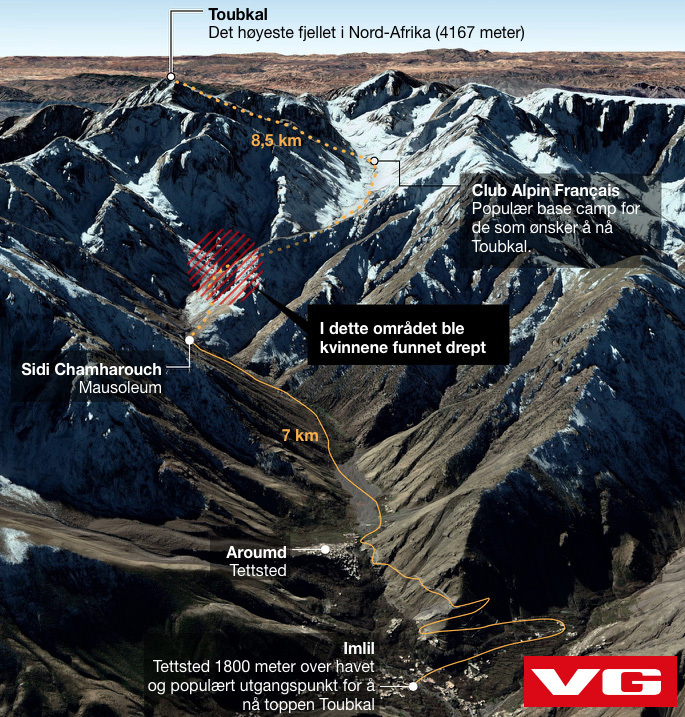 A recent atrocity was the brutal killing of two Scandinavian backpackers in December 2018, while camping in the Moroccan High Atlas, below Mt Toubkal (right). In January 2013 some 40 workers of several nationalities were killed during a siege and the ensuing army raid on a gas plant in In Amenas eastern Algeria. 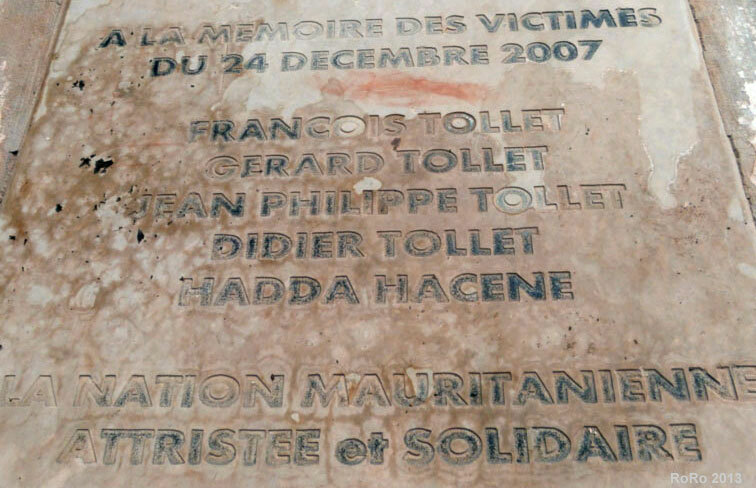 Nearly all the attackers (and many others) were killed by the Algerian army. 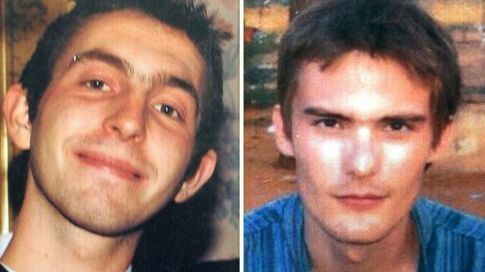 The attack was attributed to Moktar Belmoktar (‘MBM’, on the left, above), one of the key players in Saharan kidnappings from the start. 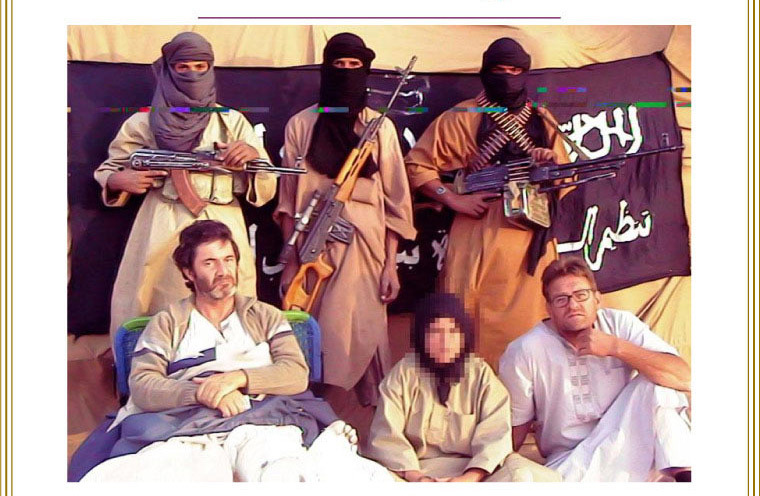 In early March 2013 AQIM confirmed that a his counterpart and rival Abou Zeid (above, on the right) was killed during the French Operation Serval in northern Mali. Full story here. In 2015, and again in 2016, it was also reported that MBM was been killed by air strikes in Libya. He no longer features on US wanted lists, but this article in 2017 suggest he’s still influential, while not spelling out if he’s actually alive. Westerners are also being kidnapped or taken to northern Nigeria and especially Burkina Faso, some by groups affiliated or supporting AQIM. And since the Egyptian revolution the Sinai has become a less safe place for tourism, though until the growth of IS influence this was more conventional banditry and ransoming by Bedouin. 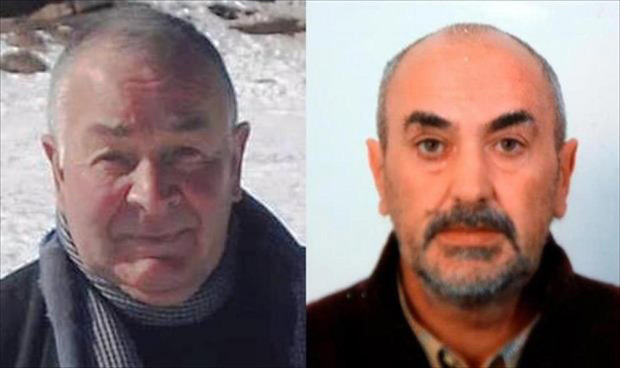 At the time of this December update captives include: two Romanians (#23A and #35). Swiss, Australian and American missionaries (#27, #28, #30); a French NGO worker (#31), a Colombian nun (#32), a German NGO worker (#33) a South African paramedic (#34), and an Italian priest (#36). Additionally, in Burkina there has been at least one abduction soon ending in murder in January 2019, as well as a tourist couple missing there since December 2018. This new thread follows such events in the Sahel and West Africa. Thirty two European tourists (right) taken in several snatches. Mostly Austrians, Germans and Swiss. 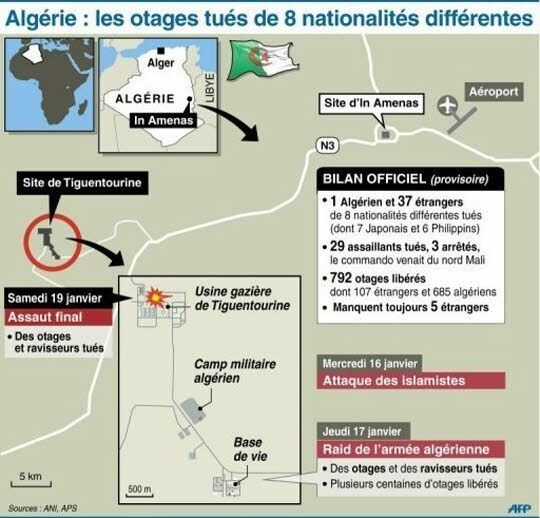 Half were freed following an army raid in May, the rest were allowed to move on to northern Mali (see map, left) where they were also released in August 2003 for a €4.6m ransom. One German woman died while in captivity from heat stroke. A group of some 22 tourists of various nationalities were robbed and briefly held by Tubu bandits somewhere near Bilma. Most were released after a day, apart from two, including the Italian group leader, who were taken hostage and held captive near Korizo, in far northwestern Chad. Released after 55 days following intervention and possible ransom payment by Libya. American missionary near Zoumri by MDJT (Tubu rebels). Accused of being a spy despite being based there for many years. Two Austrians (right) driving in the Grand Erg dunes. 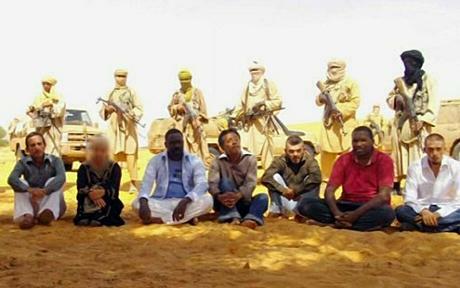 Held in northeast Mali where they were released in November 2008 for ransom. Tour group of some eleven Europeans and nine Egyptian crew. Version 1: all rescued a few days later in northwest Sudan following an Egyptian army operation. Version 2: Ransom quickly paid; all hostages released. Canadian UN envoy and his party (right) from a moving car. Released in April 2009 in northeast Mali for €700k ransom. Two Swiss, 1 German and 1 Briton on an organised tour visiting music festivals. All held in northeast Mali. Two women released in April at the same time as the Canadians (#6). 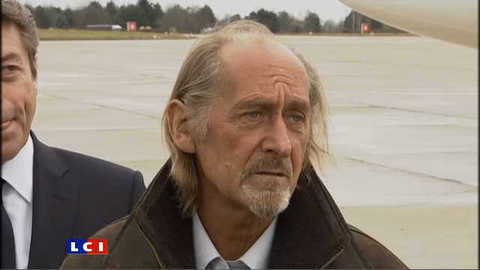 The Briton, Edwin Dyer (right), was executed in June and the German released for ransom in July. A Frenchman from outside his hotel in Menaka – possibly ‘sold on’ to AQIM. 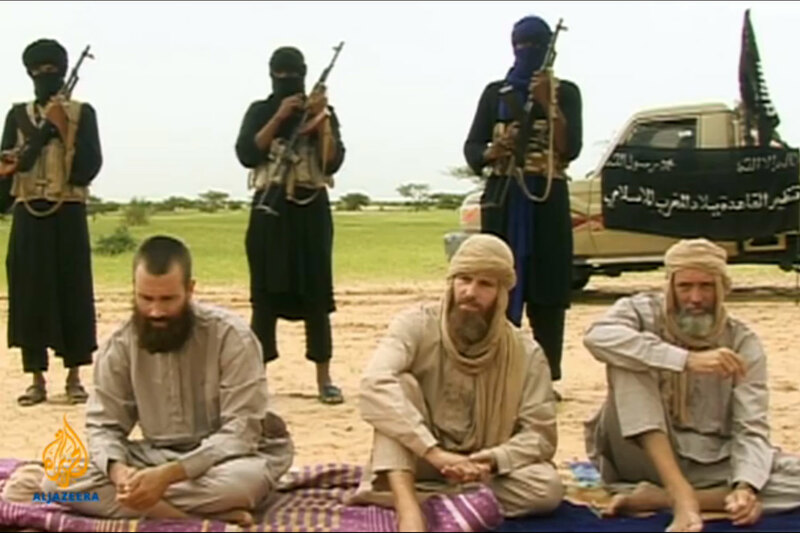 Freed (right) in northeast Mali late February 2010 following the controversial release of AQIM prisoners by a Malian court, much to Algeria and Mauritania’s displeasure. Thought to be a French DGSE agent (similar to CIA). €5m ransom payment denied. Three Spanish aid volunteers from the end of a large convoy. The woman was released in mid-March for ‘health reasons and after converting to Islam’. After nearly nine months the two men were released in northeast Mali in August 2010. It immediately followed the release from a Mauritanian prison of the individual who was said to have been hired to kidnap the group. The payment of an €8m ransom was confirmed a day or two later. 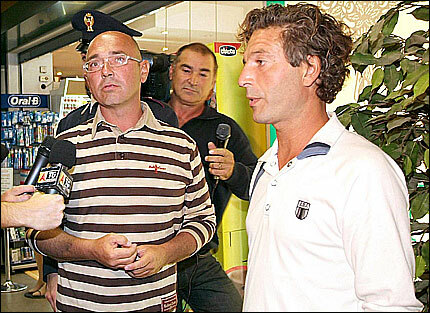 Two Italian nationals (right) hijacked from their van. 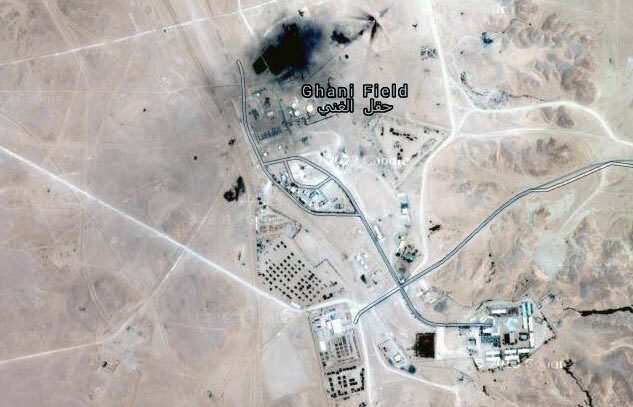 Released north of Gao in mid-April 2010 after AQIM prisoners, including one accused of the crime, were also released. Reports of an €8m ransom payment was denied. A 78-year-old French national and his Algerian driver seized near In Abangaret well, 150km south of Assamaka. The Algerian driver was abandoned a week later in northeast Mali where the Frenchman was held captive. A couple of weeks later it was reported the driver was either arrested or extradited from Algeria back to Niger, accused of involvement with the kidnap and later released. 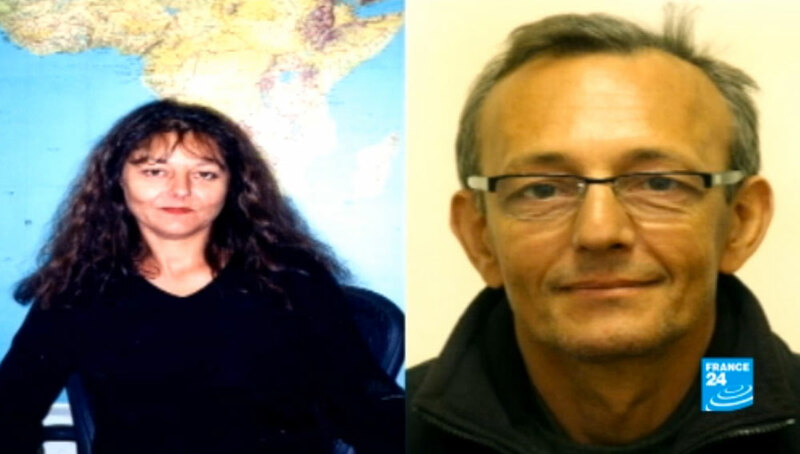 Both sides claimed that Michele Germaneau was executed in July, following what was reported as a failed French-Mauritanian operation to release him. It’s more probable he died in captivity some weeks earlier as a result an untreated health condition. Five French nationals among seven workers kidnapped from the Areva uranium mine near Arlit. They were said to be in the Timetrine region of Mali in the hands of AQIM hardliner About Zeid (also behind #7 and probably a couple of others), who had been demanding up to €90m. Three were released in February 2011. More news here. The four were finally released in northern Niger in October 2013, after over three years captivity. €20m ransom denied. Two young French nationals kidnapped from a restaurant in Niamey by AQIM. Found dead within 24 hours south of Menaka in Mali, following an attack on the abductors’ convoy by French helicopters based nearby. The action was thought to represent a ‘zero tolerance’ attitude by the French authorities towards abductors escaping with hostages. More news here. 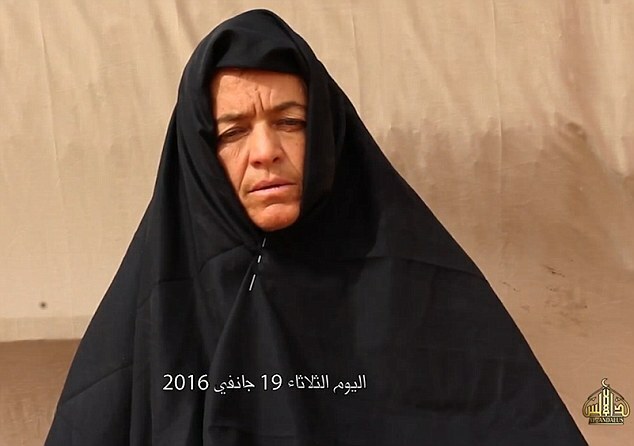 An Italian woman kidnapped from near Alidemma arch, 200km south of Djanet (and just 100km from the unmanned Niger border) by AQIM, or sold on to AQIM. Thought to have been held in Mali. More here. Released (right) in mid-April 2012 in Tessalit and flew home via Ouagadougou. Reports of €3m ransom payment denied by Italian government. Two Spanish and an Italian aid worker grabbed from Rabouni transit camp, 25km south of Tindouf. More here. The off-limits Tindouf region in the far west of Algeria borders Morocco, Mauritania, Western Sahara and Mali and is full of refugees camps for Saharawi displaced following the Polisario war over Western Sahara which is now part-occupied by Morocco. 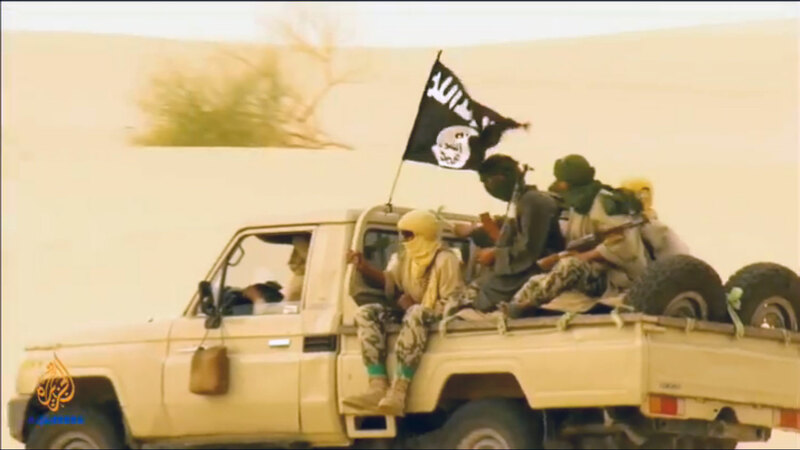 Responsibility has since been claimed by the Movement for Unity and Jihad in West Africa (MUJAO), an AQIM splinter group who later carried out a suicide bombing in Tamanrasset in March 2012 and have since merged with Moktar Belmoktar in 2013 after MBM was expelled from AQIM in 2012. All three were released in July 2012 in exchange for two prisoners held in Mauritania, including the suspect who was accused of kidnapping the three in the first place. MUJAO claimed a €15 ransom and others did not deny it. 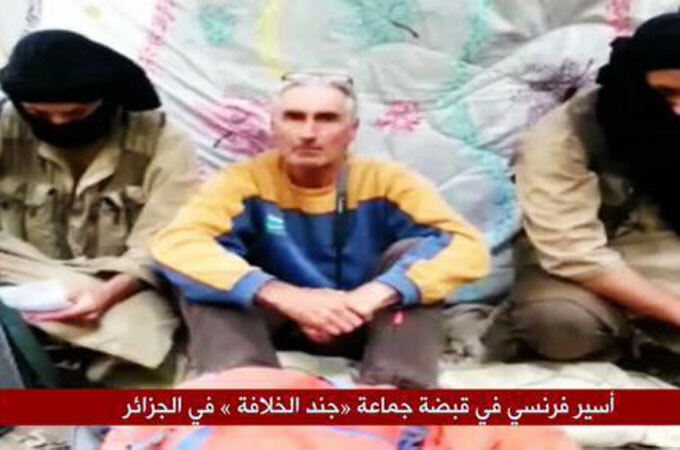 Two French ‘geologists’ (right) thought to be private military contractors (PMCs) involved with securing the release of #12. Grabbed from their hotel in the middle of the night by AQIM and taken to north Mali. More here. 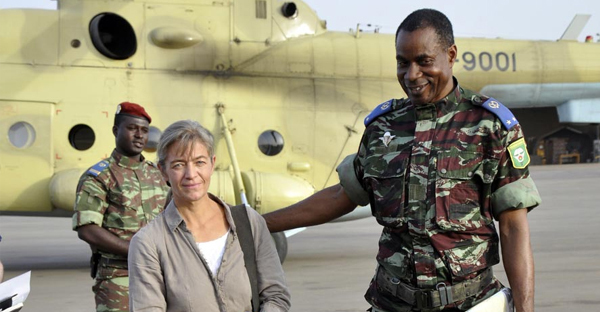 With the exception of Menaka (#9 – also with French secret service connections), this was the first abduction deep inside Mali and south of the Niger river. 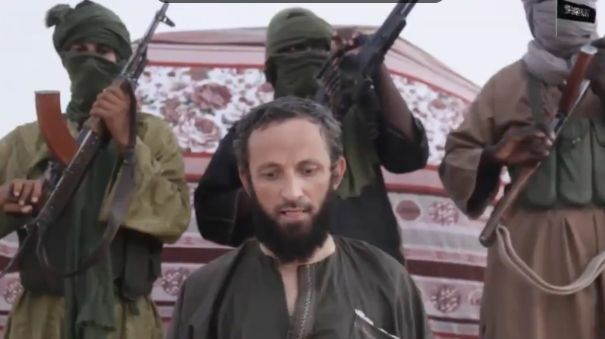 One of the two, Philippe Verdon, was executed by AQIM in March 2013 in retaliation for the French military operations in north Mali (his body was recovered in July). 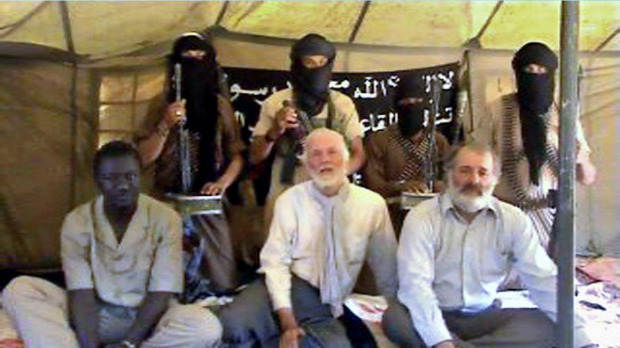 Serge Lazarevic was released in December 2014 in exchange for two AQIM prisoners held in Mali. A day after the above event, four overland tourists: Dutch, German, Swedish and a South African/Brit were kidnapped from a hotel in Timbuktu in broad daylight. The wife of the Dutchman managed to hide, but the German was shot dead while resisting. More here. AQIM claimed responsibility for this and #16 a few weeks later. In September 2013 a video of the three as well as what were the remaining four from #12 was posted via a Mauritanian news agency. 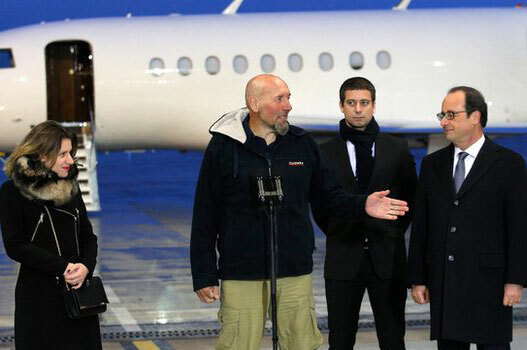 In April 2015 the Dutch hostage, Sjaak Rijke (right) was freed by chance during a French military raid on a camp near Tessalit, northern Mali. 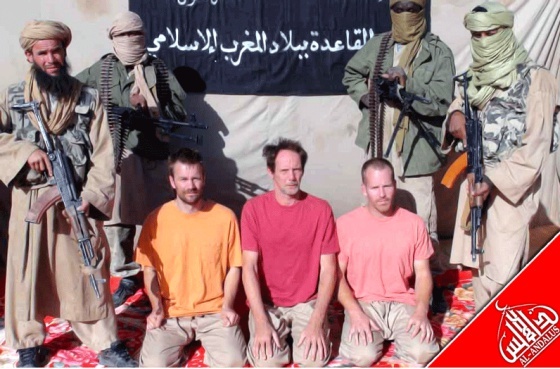 In June 2017 the Swede Johan Gustafsson (left) was released after over 2000 days, and South African-Brit, Stephen McGown, was released a month later. More on his experience here and here. 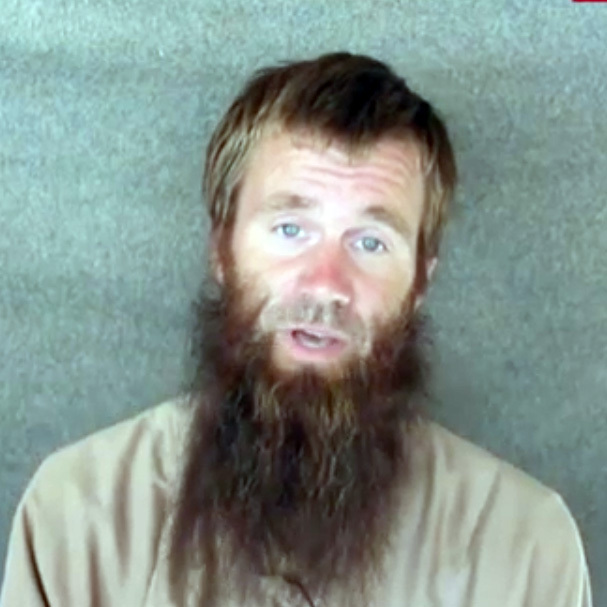 The South African government denies a $4.2m ransom was paid for McGown’s eventual release. A Swiss missionary Stöckli, was taken by armed gunmen from her house in Timbuktu a week after most foreigners fled the town following Tuareg separatists moving in and taking control (along with the rest of north Mali). 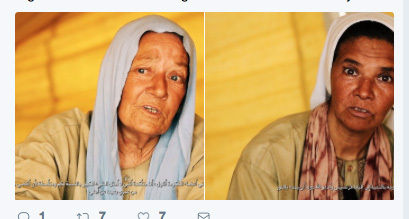 Following a raid by Ansar al Dine, the main rebel group who took over Timbuktu, just a week later she was freed from her captors and released by Ansar it’s said for €1m ransom. In January 2015 it was reported she was kidnapped again. 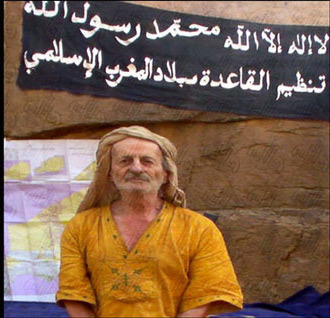 A 61-year-old Portuguese-born French citizen was kidnapped in late November in Diema, on the regular road between Mauritania to Bamako. Thought to be in the hands of MUJAO (not AQIM). More details here. News report here. 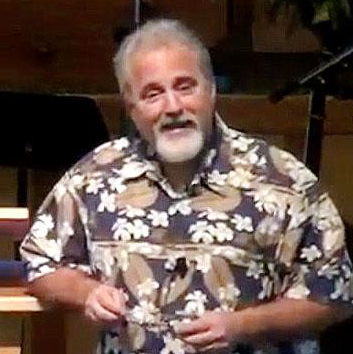 In April 2014 his captors reported that he had died. A raid with all guns blazing by the Algerian army on a besieged gas production plant close to the Libyan border concluded in the death of 40 workers of at least 9 nationalities, as well as 29 of the 32 militants. The seemingly suicidal attack failed to escape with any hostages and was attributed to Moktar Belmoktar. More details here. MBM since merged his group with MUJAO and conducted raids from Libya on Agadez and Arlit in north Niger. 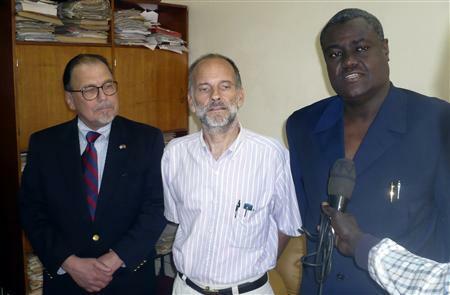 Two French journalists working for RFI were kidnapped after leaving an interview with a local MNLA leader. Following what may have been a pursuit, their bodies were discovered a few miles east of Kidal. The French military stationed nearby insist they had no confrontation or that the event bears similarities to #13. Other explanations and outcomes offered here. The executions have since been claimed by AQIM. 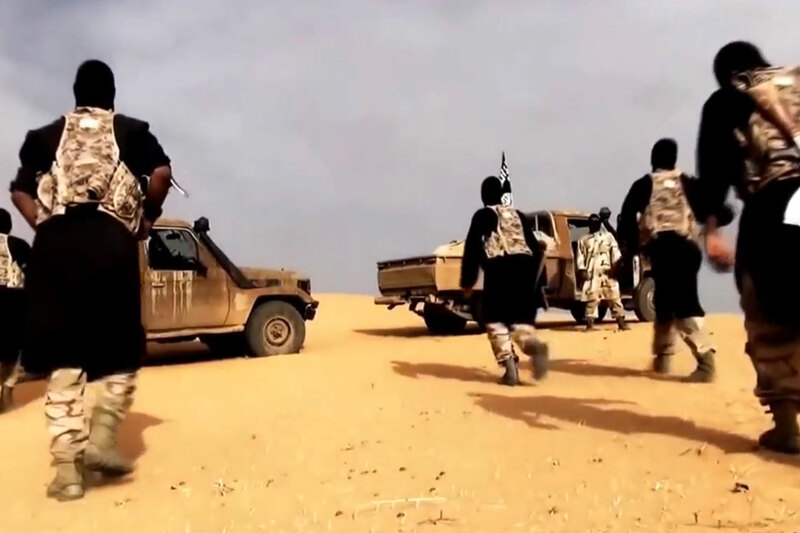 A French tourist just arrived in Algeria was kidnapped by a newly IS-afflliated group called Jund al-Khalifa in the south of the Tizi Ouzou region, 100km east of the capital. His car was stopped by an armed group and his two Algerian companions were released. Herve Gourdel was beheaded three days later. More details on this thread. Nine foreign oil workers including 4 Filipinos, an Austrian, 2 Bangladeshis, a Czech and a Ghanaian were kidnapped after al-Ghani oilfield, 250km southeast of Sirte, was attacked by IS militants. Several guards were also executed. More here. Three weeks later the 2 Bangladeshis were freed, whether for ransom is unclear (some 30,000 Bangladeshis work in Libya). Nothing has been heard of the others. A few weeks earlier 21 Egyptian Coptic Christians who’d been kidnapped from Sirte were executed en masse by IS affiliates. 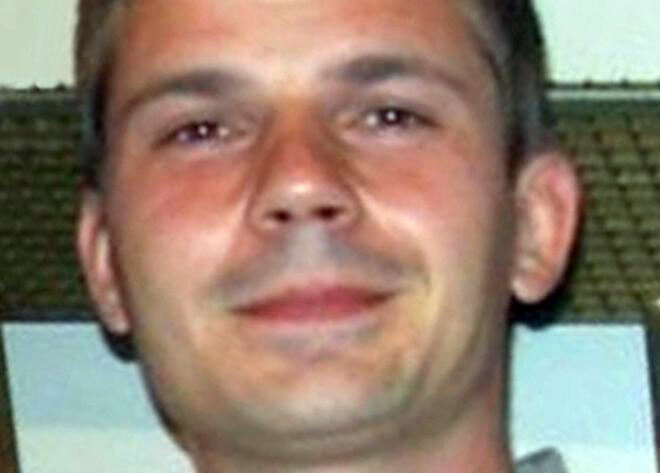 A Romanian worker, Iulian Ghergut, was kidnapped from a manganese mine in Tambao, north-east Burkina Faso. Al-Mourabitoun, founded by the notorious Mokhtar Belmokhtar, claimed responsibility. 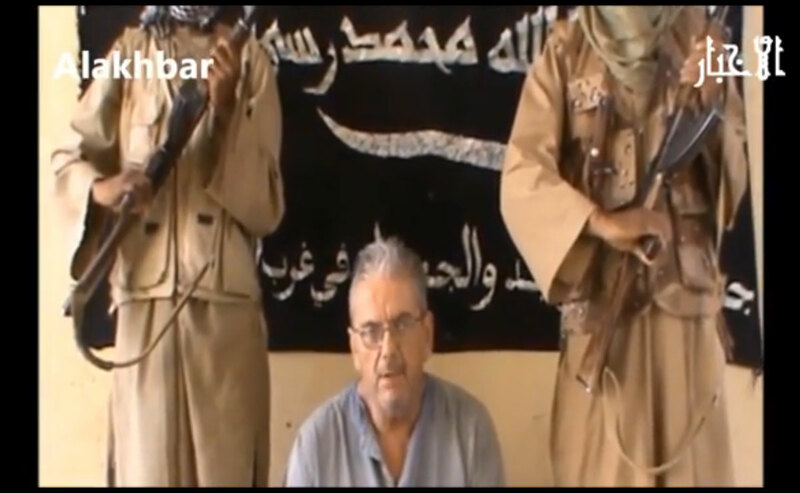 In August a video was released of the captive, probably being held in northern Mali. 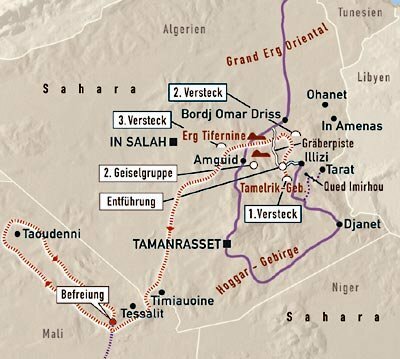 Four Italian oil workers were kidnapped near the Mellitah oil complex 100km west of Tripoli as they returned to work from Tunisia. Italy had advised its nationals to leave the country many months ago. Eight months later two escaped or were freed but the other two who’d been earlier seaprated were reported killed. Two Serbian embassy employees kidnapped in Sabratha when their convoy was ambushed on the way from Tripoli to Tunisia. More here. In February 2016 they were among 40 killed after a US air strike struck the Sabratha compound where they were being held. 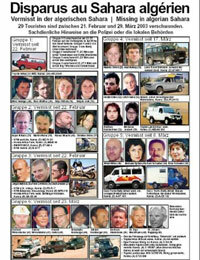 The Swiss missionary Beatrice Stöckli who’d been kidnapped in 2012 (#18) was kidnapped again from Timbuktu by gunmen, where she’s lived for many years. More here. Two weeks later a video was released by AQIM. 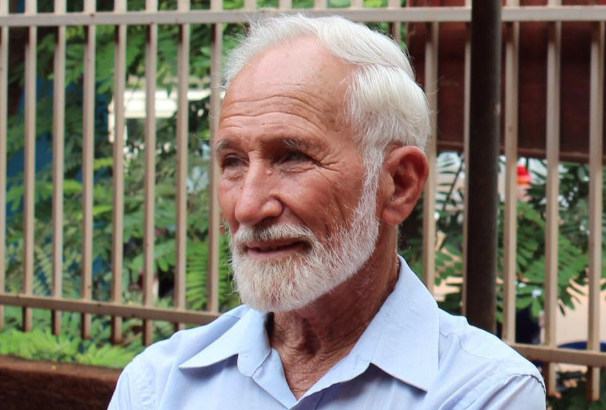 Two elderly Australian doctor-missionaries, Ken and Jocelyn Elliot kidnapped by Ansar Dine near Baraboulé in northern Burkina where they’ve lived for many decades. This follows an attack by AQIM-affiliated jihadists a day earlier on a hotel in Ouagadougou (similar hotel attacks occurred recently in neighbouring Mali). More on the kidnapping here. In 2016 Jocelyn Elliot was released. Two Italian airport workers and a Canadian kidnapped in Ghat, southwest Libya. Released in early November with no mention of ransom. An American missionary/NGO worker, Jeffrey Woodke, was kidnapped from the village of Abalak, south of Agadez where he’d lived for many years. His two guards were killed and it’s said he was last seen heading towards Mali. More news here and here. 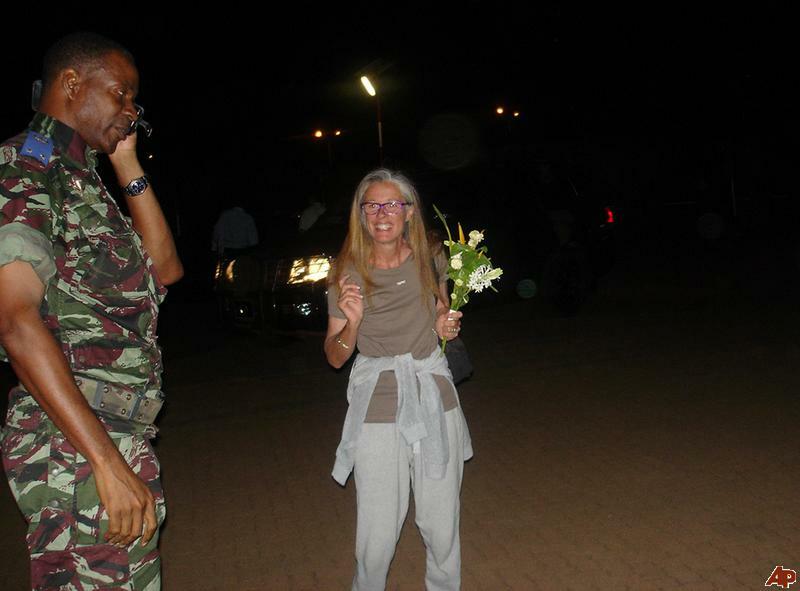 A French woman, Sophie Pétronin, who ran an NGO AAG supporting local children was kidnapped in Gao, the French foreign ministry has confirmed. More news here. Update here. A Colombian missionary nun, Gloria Narváez Argoti, who’d been in Mali ten years was kidnapped near Koutiala, between Sikasso and Segou, close to the Burkina border. More here. In June 2018 a proof of life video was released showing the two women together, now seemingly in the hands of the new umbrella movement JNIM. 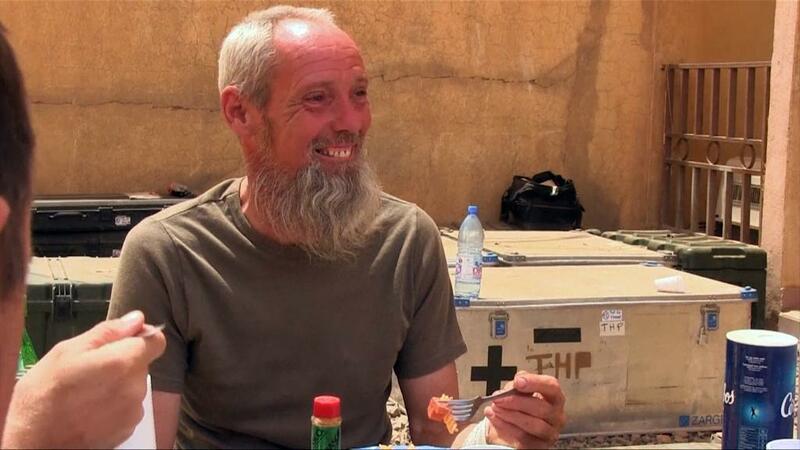 A German aid worker, Jörg Lange, kidnapped by a jihadists on motorcycles while travelling in an area southeast of Labbezanga in western Niger, close to the restive Mali border. More here. It’s emerged that three Turkish oil engineers were released in July 2018, having been kidnapped in the vicinity of Ubari in November 2017. A South African paramedic taken with them is still thought to be a prisoner. Four oil workers, three Libyans and a Romanian, were kidnapped near their plant in Ubari. Two were quickly released; the Romanian was not among them. More here. 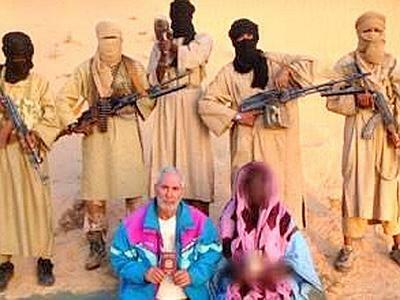 Italian missionary, Pierluigi Maccalli, kidnapped in Bomoanga, southwest of Niamey close to the Burkina-Niger border. Not a Saharan kidnapping, the kidnappers are ethnic Peuls (aka: Fulani), rather than a jihadist group.